A group of roller skaters wearing professional protective equipment stood in four lines on the first floor of the Olympic Sport Stadium, one of the venues in the National Olympic Sports Center where a fitness carnival was held from August 7 to 9. Some of them were grey-haired, but all were busy practicing. "Left, right, and pay attention to your knees," their coach shouted abruptly. Heavy rain poured down outside and several passers-by sheltered under umbrellas to watch them. "Most of us are retired and we just got together spontaneously to form this Beijing Happy Roller Skating activity," said Huo Shuhong, a 66-year old retired official from the Ministry of Chemical Industry, during a break. "Normally, we practice at the Olympic Green beside the Bird's Nest every morning, but today we come to the fitness carnival held by the Olympic Center." The coach was seriously correcting every member's actions one by one during the break. "Our coach is a Korean named Li Mingguo (in Chinese Pinyin) who was an athlete before. Several months ago, by sheer coincidence Li saw us practicing at the Bird's Nest. And he decided to coach us for free since we skated really badly at that time. Coach Li coaches us every Tuesday, Thursday and Saturday morning, but never asks for any reward," Huo proudly added. Established three years ago, Beijing Happy Roller Skating is a voluntary club with about 300 members, mostly retired. The club has a team leader, Jiang Pingli, two secretaries in charge of coordination, a team flag and a team song. Members assemble at the Bird's Nest at 6 o'clock every morning to practice. "We seldom skate at other places since completion of the Bird's Nest. We enjoy skating there so much since the open public land is flat and very suitable for roller skating," said team leader Jiang . Roller skating used to be considered a childhood pastime, but the Beijing Happy Roller Skating is changing that image. "We feel so happy and satisfied while skating. 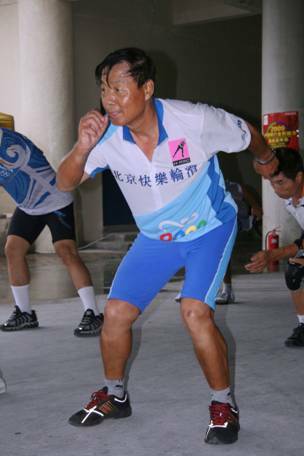 Although we are retired, we are not old since we are healthy," Jiang Pingli added, "Many people see us skating and join us, and you know some of them are foreigners living nearby." At a debriefing last November, the International Olympic Committee said the Beijing Olympics had brought changes to China in areas as diverse as press freedom, the environment and public health. Chinese people are absorbing the Olympic legacy of public health in their own way. Zhang Xiaole and his Japanese wife Mariko used to go mountain climbing before but have become greatly interested in roller skating recently together with their six-year old son and joined Happy Roller Skating. "Everyone can find his own strong point in the process of doing sport. Sport should become a part of everyone's life. The Bird's Nest is really a great place to join people who love sport and wish to be healthy," said Zhang Xiaole, who works in the field of cultural exchange and collects antiques as a hobby. "Take my family as an example; we three really enjoy the feeling of happiness while doing sports," added his wife. The couple's dream is organizing the roller skating club members to skate to Taiwan in the future.